One year's transformation | What a difference a year can make. Spring has begun and the CrossFit Open has concluded. Today I did the last workout, and it took me way beyond my pain threshold and while I finished it was a long 17:06. With the Open over and the change of the seasons it is time for me to push myself in new ways and grow through some different challenges. I have made some programming changes and this blog will highlight what I do inside in the gym, but also the challenges that I’m working out in life in general. -Complete the entire 13 week Smolov cycle and finally break a 400 pound back squat barrier. -Run in the Rollercoaster Race 5k, and finish with a time under 25:00. -Go to WLC and put in my packet to become an E5 with the Illinois National Guard. -Register and enter grad school full time to complete my public history masters. To say that this will be an exciting year is downplaying it a bit. I will be growing in many areas of life. Chasing my educational goals to be back in the Park Service soon. I’m pushing my limits in health and fitness and running and competing in various ways. Finally I’ll be growing in my military service as well. And I volunteered to go mobilize for the National Guard, so who knows this blog may be coming to you from somewhere outside the US by the end of the year. This month I’m doing prep for the open by working on some extra mobility everyday and also doing more skill work whenever I have time for it. I’m also taking HMB+ from Blonyx and so far the stuff has been great. My soreness is way down and I feel better headed into the workout everyday. I’m looking forward to seeing how I progress as the next few weeks go and discussing the way my body responds to all this work. Hopefully I’ll see some better times, some big numbers and generally feel better. I also am down 11 more pounds from the Whole 30 month, but I have a feeling a little of that will come back, as this week I have been hungry all the time. Maybe April will have to be a leaning cycle to get myself ready for summer and the need to show off this awesome body I work for. Tomorrow I’ll weigh in and take my after pictures to see how I did, but tonight I broke my Whole 30 with two squares of Lindt 90% and let me say that you know it’s been a long time with no sugar intake when that is too sweet for you to handle. It’s had been a long 30 days but I have to say that I am happy to have it over with. Closing out the month I have started both jobs and been working like a madman to pay the bills. Can’t wait to see the final results and reintroduce some foods back into my intake. Especially with my birthday coming up later this month. This has been my first attempt at doing a Whole 30, and while I believe that I have lived up to the guidelines I don’t know that I’m in the spirit of the experiment. You see just before starting this I came down with something. I didn’t know what it was but I didn’t feel the greatest. Going into the 30 days I hoped that my 30 days would see my food intake helping me to conquer the feelings that I was having. That has not been the case. So while others have talked about sleeping better, and having more energy, I’ve struggled with feeling like crap and tossing and turning all night. While others have discussed feeling full more and looking forward to meals I have struggled to eat sometimes and really just wished that there was some comfort foods that I could have. Doing a Whole 30 while sick has been no fun but I know that I’ve learned some things. First off I’ve learned that I’m not indestructable, I have limits that will show themselves often and that while the way I eat helps me to stay healthy, it is not impossible for me to get sick. I’m also learning that I’m an old man and that I don’t bounce back as quick as I used to. This flu that I’ve had is pretty nasty this year, and I’m still pushing on, but everyday I can tell that I’m not where I should be. I have also learned that there’s a lot more mental toughness to this game than I gave myself credit for. Even sick this month I have not been taking extra days off, I’m still walking into CrossFit DNA everyday and doing my best to take on the WODs. They have been rough, and my body does not respond the way that it did when I was healthy but I’ve been scaling more and just pushing myself to do the best that I can. I feel like I’ve been learning a lot about myself this month, that I’m learning about my limits and learning how my body works better. I have also had to depend on the mental side of the game more and more because I don’t have the physical power that I used to. I’m also learning more about delaying my gratification in some areas. I have wanted certain foods this month like crazy, but I’ have held strong and at the end of the challenge I can’t wait to dive into some foods. It’s been a rough month, but overall I have pushed through and that’s really what it’s about. Being sick this month has changed the way that I would have felt during the challenge emotionally. I think that had I been healthy this might have been a pretty easy month, but then again it’s not about being easy is it? When you take on these kind of challenges you have to take whatever comes you way, sometimes you get lucky and it’s pretty easy. Other times you get the flu and feel like death for a month. Guess that I will just hope for the next time I do a Whole 30 I don’t get sick right before I start. Pushing past your barriers seems like a never ending experience for me in the last year and a half. From the time that I first walked into Capital City CrossFit I knew that there was a long road ahead, and throughout I’ve been working to conquer the road ahead. Often it has felt like a never ending uphill battle. The little victories are all that I have sometimes, the last couple months there has been nothing but barriers in my head. I wonder what it is that keeps me going, and everytime I come back to the community of people that I’m now a part of. Day in and day out the people around me keep me going, to honor that community I struggle and work to get through the problem areas that I have. The support of these people day in and out helps me through the struggle and I owe them for everything I’ve been able to accomplish. Going forward I’m going to keep pushing and go past the barriers that I have now. I owe it to everyone there with me deserve my best efforts, and I’m going to keep on going till I can’t do another rep. Finding that strength inside will help me to do more and be better everyday, and the people around me will hopefully see new PRs from me as I keep going forward. I feel like I’m just getting back to normal at the end of the day after yesterday. What an experience the day was. I can honestly say that I had a blast, but it wore me out. Walking into Capital City CrossFit I knew I was in for a marathon of a day but I don’t know that I had prepared myself for it fully. In the end I’m going to try and highlight some of the best moments of the day. First was actually being a competitor myself with the best guy I could imagine taking on the day with, Tony, you did great and we did our best I can honestly say that. Here we are kicking off WOD 1 with our 50 Cal row. For a couple guys that didn’t get to practice the movements together to put a strategy together based off that I really think we did well. And for two big boys those broad jumps were not our strongest thing but we still did great. The second WOD we took on Wall Walks which I hate and were the death of me. I failed four attempts to get my second round done and that killed us for that I’m sorry man, but you are the best, if there’s another chance to team up, we need to do it again. Secondly was judging, I loved meeting all the pairs that I was judging and although in some of the female heats I had a bit of a creeper feeling as I was staring at your midsections to make sure you were getting your bellybuttons to the wall it was still a great time. You all did great and the Rx women were crazy impressive. You intimidated me to no end, and more than one of you I would’ve killed to ask out at the end of the day. Seeing the hard work you put in inspires me to keep on pushing and getting better. I can’t wait to take some of you on as competition again. 2013 is going to be a year full of me killing it whenever I can in competitive exercising. Third was the chance to be the eyes and ears for two companies and talk about their products and rep them a bit, as well as hashtag them as much as possible. Seriously it felt like it was a AMRAP hashtag for Blonyx and KillCliff. I hope that I did you both proud and that you will give me the chance to rep you again at things. Let me just throw this one out there for you both, North Central Regional dual company booth. You let me know and I’ll be there to pass out swag and rep your companies to the best of my abilities. I loved talking you up, and the people couldn’t get enough of the Tasty that KillCliff sent me, seriously it was gone by the time the first heat started. I wish I had gotten cases of the stuff to sell, I would’ve made a mint. I am hoping to do more with both companies, currently I’m an affiliate for Blonyx, they have great recovery through their HMB, and I’m going to start taking the HMB with Creatine for strength gains going into the open. At the end of the day we gave away a lot of great stuff to the winning teams, including gift cards to Blonyx, Rogue Fitness and a can of Kill Cliff. Leaving after 12 hours I was exhausted and hadn’t really eaten anything all day. A quick stop for some food and I was headed back home. This trip back to Springfield was far too short but I’ll be back soon, and hopefully this time it will be just to hang out, spend far too much time playing at Capital City CrossFit and will include a fun Strongman Sunday of picking up heavy things. I can’t say enough about how awesome this experience was, and if you have a competition coming up in the midwest, make sure to let me know. Wow what a day, after spending 12 hours at Capital City running around between competing, judging other divisions and doing social media for Blonyx and KillCliff to promote their products I am a beat man. I’m back at home and I will post a full recap tomorrow but let me say that it was an amazing time and that I had a blast. 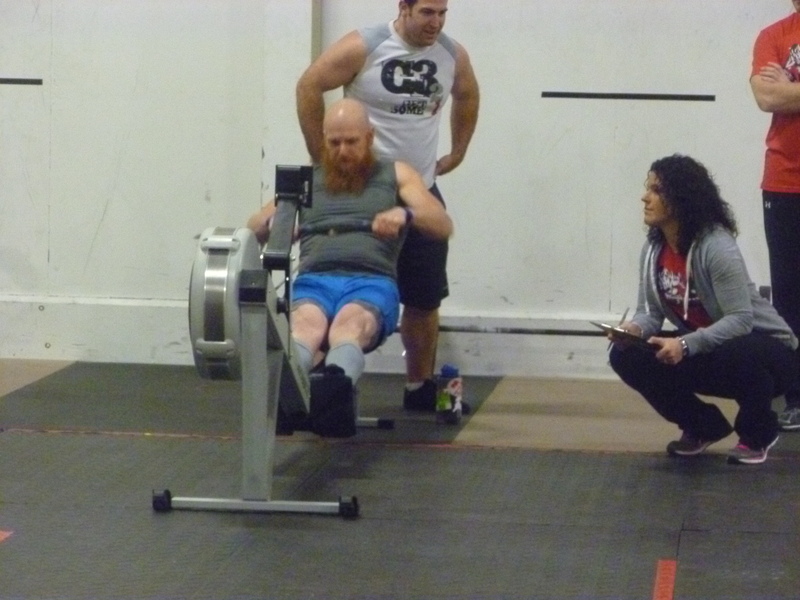 I can’t wait to do it again, and I’m going to leave this post with a couple pictures of me doing my thing during the WODs. Tomorrow I’m headed down to Springfield for the first competition of 2013, and my first team competition ever. Tony and I will be in the Intermediate division of the Icebreather Classic at Capital City CrossFit. First event has already been announced and based on it I’m hopeful of our chances to do well. Tony and I are pretty similar so in terms of strategy in team making we didn’t really think it through. If WOD 2 has burpees or a long run we are done for, but for now I’m a good rower, and I’m pretty good at the other movements. ³Hang Snatches are to be completed in any increment the team desires, with each person completing at least one rep. While one partner is performing snatches, the other partner must be in a chin-over-the-bar hold. Their chin may not contact the bar at any time. Time will tell how things play out during the day but I’m really excited to get back into town and put some work in with my boy Big T. I’m also crashing at his place with his pretty awesome lady and two dogs, so it’s going to be a fun time all around. After the way that I’ve been feeling lately this is just what I need. Not to get too negative but when on the job hunt and things seem pretty bleak it’s hard to keep yourself motivated sometimes and pushing yourself in other areas of life. I wonder if the Whole 30 has helped or hurt in that area. I’m going to venture to guess that it’s a bit of both. It has kept me from going crazy on “paleo treats” and such and made sure that I’m watching what I’m eating. But at the same time there’s some comfort that comes from some of that so it’s been hard. At the same time I’m over the hump with it so I’m not feeling like I’m missing a lot. Although I will admit to secretly dreaming of a meal consisting of a pound of bacon on day 31. I don’t care if anything else appears in that meal I just want bacon. Actually I take that back, I want Coffee, Bacon, and Chocolate. Even though I have had a little bit of 100% Cocoa, there’s still nothing like a quality dark chocolate bar. And I’ll be dominating some pumpkin stuff too that first week. I don’t know what but it will be big. So this weekend there will be lots of pictures, laughs with friends, and a few dirty words as I lift heavy stuff, work my hardest and try to bring one home for the team. I’m looking forward to it, and then who knows, maybe I’ll come home to find one of my many applications have brought some fruit to this job hunt. I’m really excited to move forward on this, not only is it a chance to build my roots deeper here in Chicago now that I’m with family again, but to make an impact in the area that I call home, and to learn how to be the most effective teacher possible So sorry for this post not containing anything fitness related, I’m too excited about this.